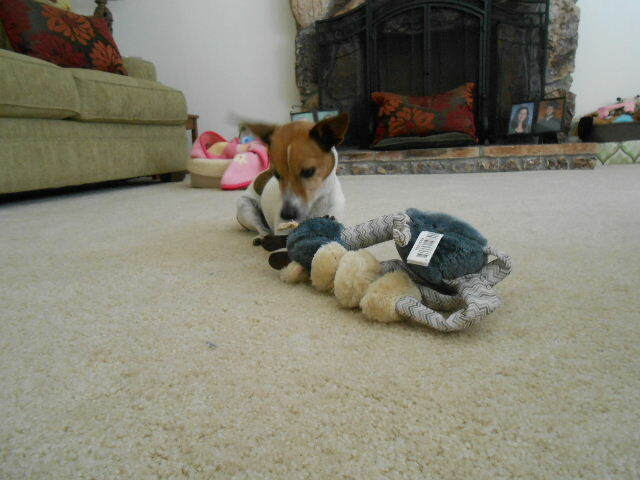 Grandma bought Misha a new dog toy. It’s a giraffe that is about the same size as her. It was cute to watch her pick it up by a leg and drag it over to the living room. Once she got there, she threw it around a few times. Then, she plopped herself down and went to work pulling the fur off the ear. She chewed it up pretty good for about 20 minutes. All that work seemed to tire her out. She laid down and rested. You know she’s tired when she allows the dog toy to put its head on her back. She eventually got up and went to bed. Ear destroyed. Her work is done. That’s an amazing toy your grandmother bought you!! I’m kinda jealous!! You’re very lucky!! I’m out of options for toys that will last. They all gut stuffed toys pretty quickly, Hershey destroys rubber toys, and my last option, rope toys, Marsha has no compunctions about literally eating them! Hershey and Marsha sound like they really like their toys…maybe too much. I have to watch Misha because she will sometimes swallow what she chews off. I’m not sure if your dogs would like them, but they make dog toys out of recycled tires. They are very think. I bought one for my Lab years ago. Of course, she didn’t like it because it was too much work. Mine are ear killers, too. And nose killers. Basically, if it sticks up, it’s gone. 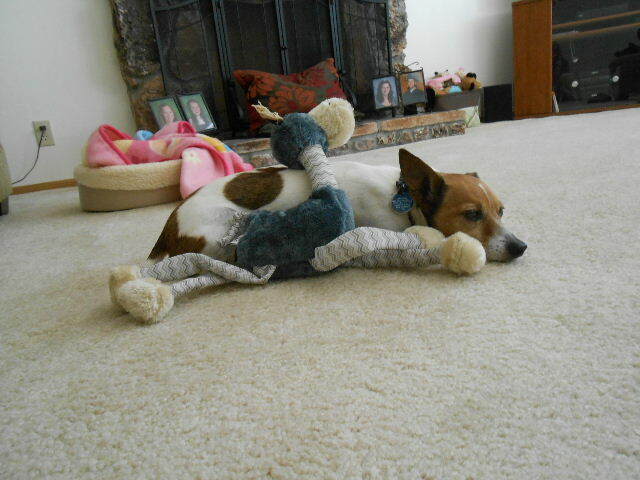 But mine don’t snuggle with toys like that. And I wish they did! It’s adorable! I’ve jokingly called Misha’s stuffed animals amputees. Many are missing an ear, paw, or nose. She’s not a squeaker attacker, but she has to chew off limbs. This is so cute, it’s a lot of work to destroy toys! 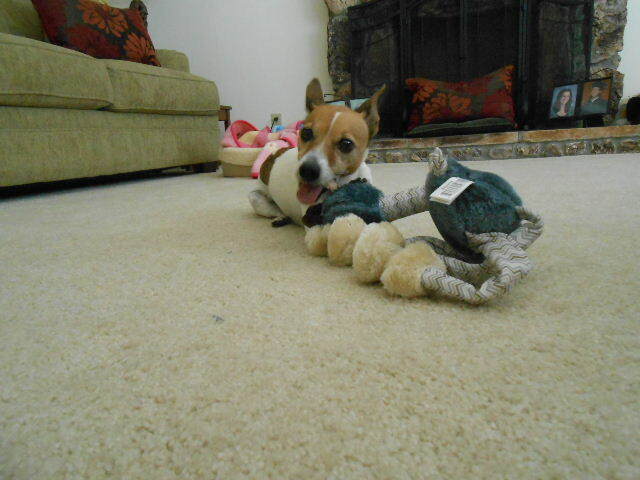 It looks like this one should last her awhile, stuffed toys are lucky if they survive 5 minutes in our house! I hope so! Misha isn’t normally destructive, except when I leave the room. I was on the phone awhile back and I guess she felt slighted. When I went into the living room, their was stuffed animal cotton all over the place. So cute they’re practically the same size!